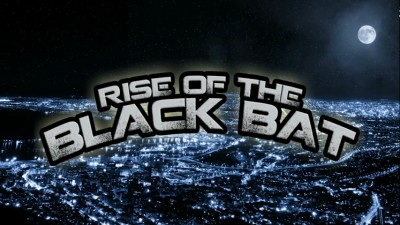 The first sign of real trouble comes with the opening titles of The Rise of the Black Bat, which are revealed sloth-slowly over four minutes of animation of city buildings. The last sign of trouble comes in the final 13 minutes of the film's 84-minute run time, which is made up of various drawings of the main character and the end credits. In between, plenty more trouble, which, if you're able to do simple math, is only about 67 minutes of movie, and there wasn't even enough good filmmaking to fill that meager space. Essentially an origin story, the film tells the tale of the Black Bat, a vigilante taking down the bad guys in a non-descript urban cityscape. He's Batman minus the ears, plus a gun, plus a touch of Daredevil, as the Black Bat is (or perhaps was) a lawyer blinded by chemicals who gains superhuman vision thanks to an experimental repair process. The Black Bat is such a straight-up knock-off of Batman that, in addition to wearing what is impossible to describe as anything but Batman's cowl with the ears cut off, he even says he chose his persona to strike fear into the hearts of criminals, a paraphrasing of Batman's reasoning for dressing like a bat. 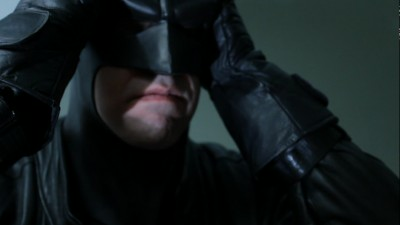 So the Black Bat runs around shooting at criminals and driving in his car with his mask on (one of many unintentionally funny [and maddeningly long] sequences in the film.] He's also a terrible shot, by the way, as every shoot-out requires a multitude of attempts, despite most such fights occurring at what seems like a distance of perhaps 10 feet. His main goal in this film is to get back at the crimelord responsible for his plight, but it's such a ridiculously stereotypical and bland concept that it can't help but fall flat, so when the quest is over, you're unlikely to care. Awful exposition: People say things simply to get information out, even if it's completely mental for them to speak in such a manner. Terrible dialogue: for example: "Call the cops. This guy is bleeding all over my carpet." Bad acting: This one's a masterclass in this regard. Between Black Bat's odd manservant and the main character's constant Christian Bale-like growl, it's hard to take anything seriously. Telling, not showing: Plenty of examples of this all throughout, as characters explain what's happening instead of us seeing it. Horrendous pacing: In a film this short, nothing should take as long as the set-up to an attempted jump scare does in this movie. Padding is everywhere. Wasted time: There's a scene loaded with gratuitous bikinis. In most films, this gets a pass. But here, it's so over the top in every way that it needed a mention. The main character, in his civilian alter-ego, attends some sort of bikini contest, in order to track down a potential informant. In most films, you might get some establishing shots, maybe the camera would ogle one of the girls. In this mess, we get to meet all FIVE contestants, in a scene that lasts well over seven minutes, before the informant even shows up! That's over 1/10 of the non-credits portion of the movie, devoted to nothing to do with the plot in the least. It is so overdone that the MC of the contest runs out of things to say and starts repeating lines. 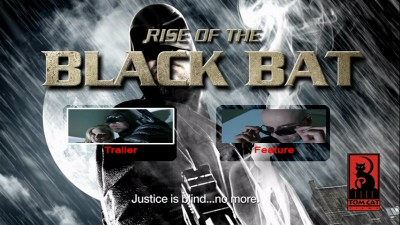 Rise of the Black Bat arrives on one DVD, which is packed in a standard keepcase. The disc has a static. anamorphic widescreen menu with options to watch the film and check out the extra. There are no audio options and no subtitles. The anamorphic widescreen transfer is actually not too bad in terms of the sharpness and level of fine detail and the color is mostly appropriate (though some there are some unnecessary color effects in spots.) Black levels however are not deep enough, resulting in difficulty making out what's happening in some darker scenes. and there are some unfortunate issues with crushing and some compression artifacts. The audio is presented via a Dolby Digital 2.0 track, and it's a very weak center-balanced presentation, with dialogue often getting buried under music (and occasionally just vanishing), while sound effects lack oomph, offering some of the weakest gunshots ever. The only extra is a meh trailer for this bad movie. It's not fun to bag on an independent film, because you have to allow that people probably put legitimate effort into it and likely good money as well. But when the very idea of a movie is bad, you just can't help but wonder why it was ever made. There is literally nothing about Rise of the Black Bat that's worth recommending, as it's not even a fun kind of bad. It's just boring and derivative. If you're looking for a good comic-book adventure from outside the studio system, try Michael Morrissey's Boy Wonder instead.